2004 Kenilworth Chess Club Champion and National Master Scott Massey lectured on Bobby Fischer in November 2004. Scott began by getting the members to discuss the question of whether or not Bobby deserved to be arrested in Japan for violating prohibitions against doing business in the former Yugoslavia. He then launched into an interesting discussion of Bobby's childhood and the various controversies surrounding him. We then analyzed two of Fischer's better games -- one from his youth that is often called the "Game of the Century" and then game thirteen from the 1972 championship match with Spassky, which Botvinnick considered one of the greatest fighting games of all time. No, that's not Scott at the demo board. 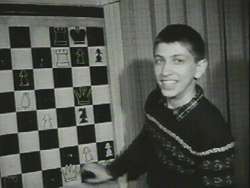 That's just the image of Bobby Fischer we would all prefer to remember. PGN File of Games from "60 Memorable"